We humans are quite self absorbed. We believe that it is us who create the greatest structures the world has ever seen. We think that we have the best techniques for conquering the planet to suit our needs. But just beneath the surface, and right under our feet, we our being outdone. By bugs – ants to be specific. And to show how impressive these little guys are, one man is determined to show us how intricate these creatures live, and the amazing things they can build. Way back in 2013, a man posted a very interesting video to YouTube. The title seemed a bit strange. 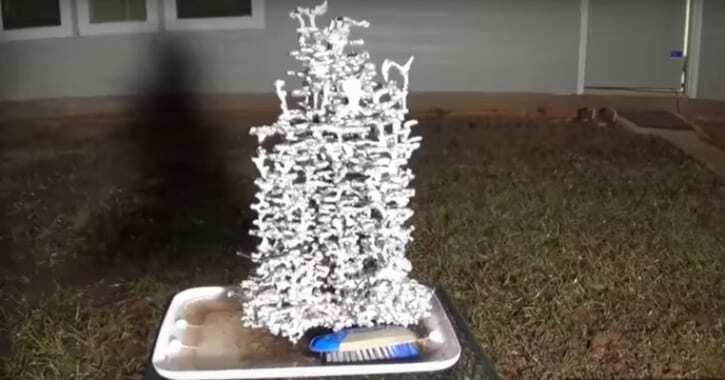 It was called “Casting a Fire Ant Colony with Molten Aluminum (Cast #043).” And it was exactly what the title said – a man pouring molten aluminum into an empty fire ant colony. The video exploded overnight and went on to become extremely popular with YouTubers all over the world. The video itself starts out simple and innocuous enough. 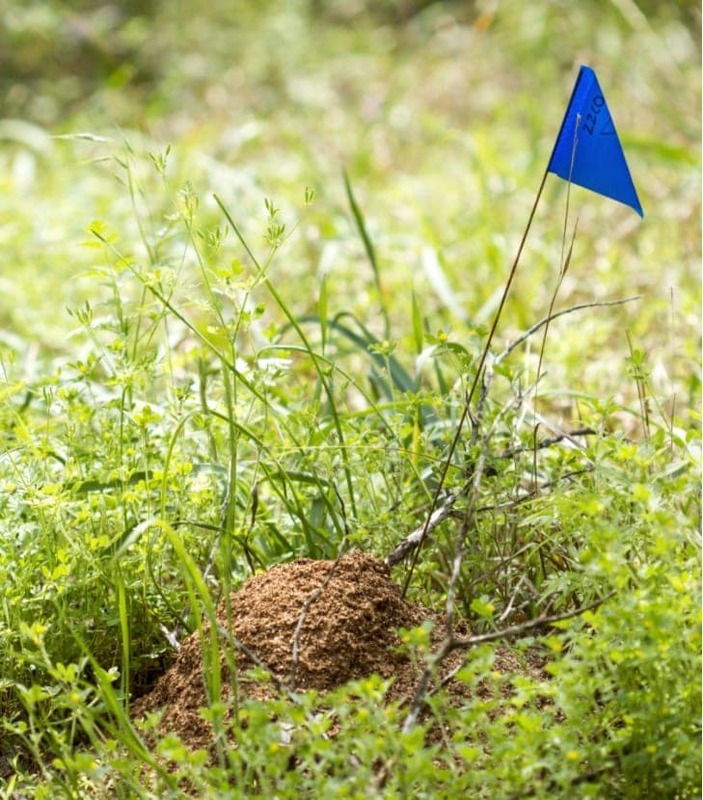 There are close up shots of the empty fire ant nest in the middle of some grass, with the nest itself looking like a small mound of dirt. The man making the video takes out a ruler in order to measure the mound. We then see the bucket of silvery smooth looking liquid. The man then proceeds to pour the contents of the bucket into the top of the ant hill. 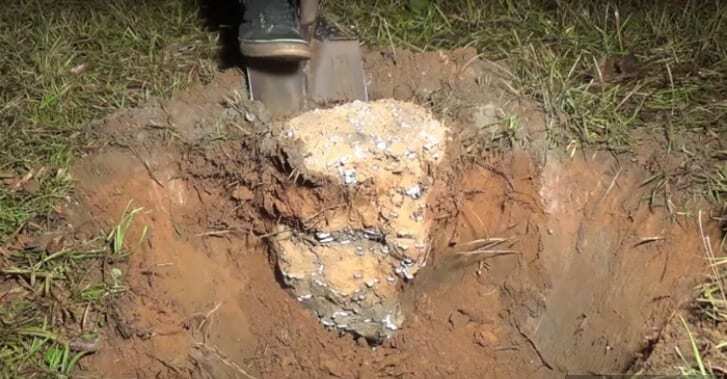 There are some more close up shots of the anthill and we can see the man in the video taking measurements of the hole as well as the height of the mound. We are not exactly sure why he is doing this nor what the measurements are telling him. Perhaps he is checking to see whether not not anybody is home. Maybe the size of the hill helps him determine how much aluminum he needs to boil down. 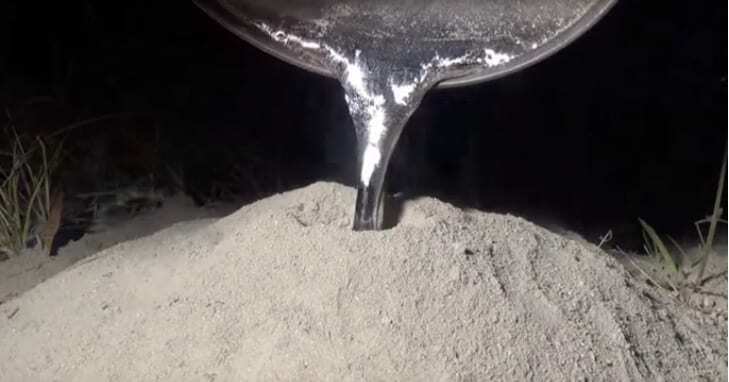 The bucket is filled with molten, liquid aluminum. In order for aluminum to be liquid it must be heated to well over 660 degrees celsius which comes out to over 1,220 degrees fahrenheit. As the man tilts this super hot liquid into the empty nest, we see the liquid shimmer and shine as it leaves the bucket and goes down into the soil below. 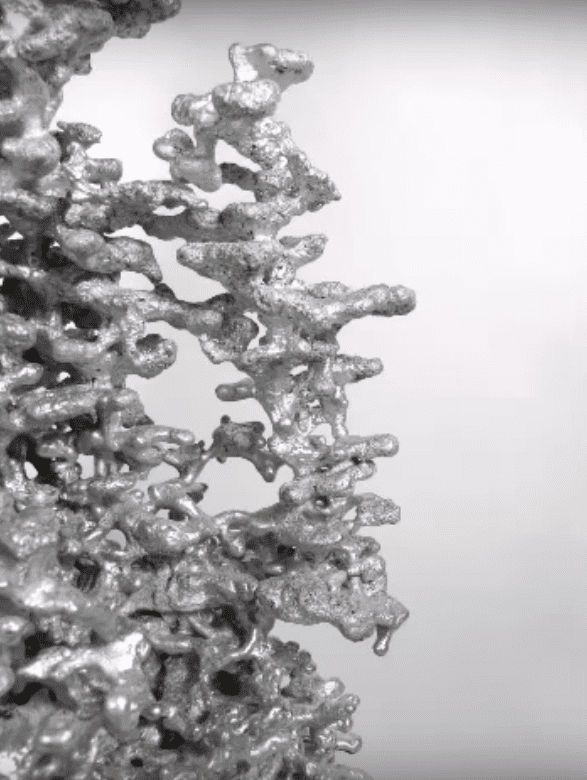 After several minutes, the underground ant structure is completely filled with aluminum. 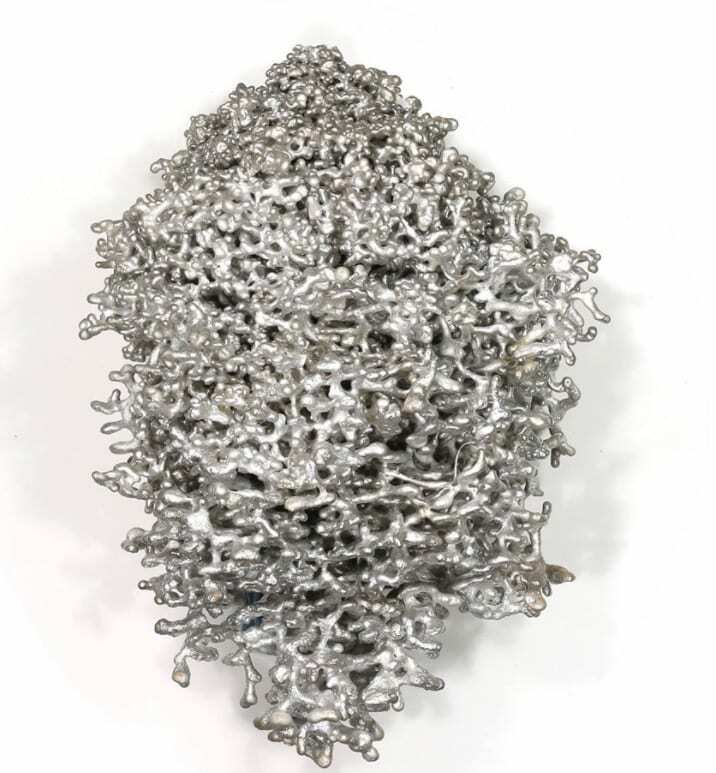 As the aluminum cools down from over 1,200 degrees fahrenheit, the mound steams and boils. If one were to pay attention to the steam coming out, one would see that there is steam coming out of little holes at the base. These little holes were designed by the ants to let in fresh air and let out heat, basically acting as a climate control. And with millions of ants in these underground colonies, it sure gets hot. 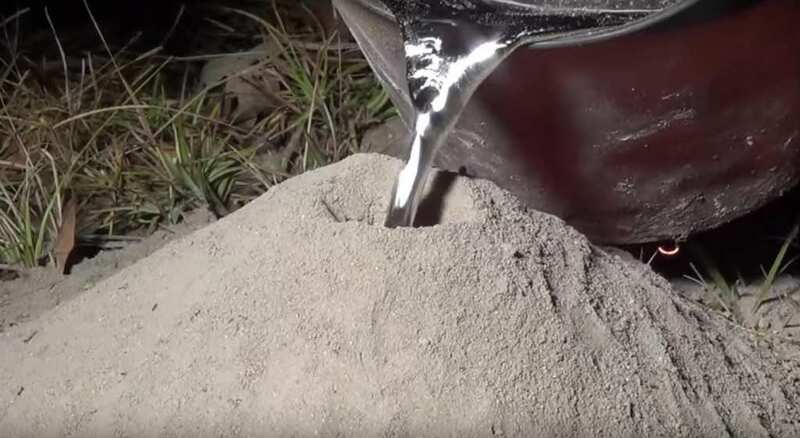 After the aluminum has cooled and hardened in a process which takes a significant amount of time, the man begins to extricate the ant colony from the earth. 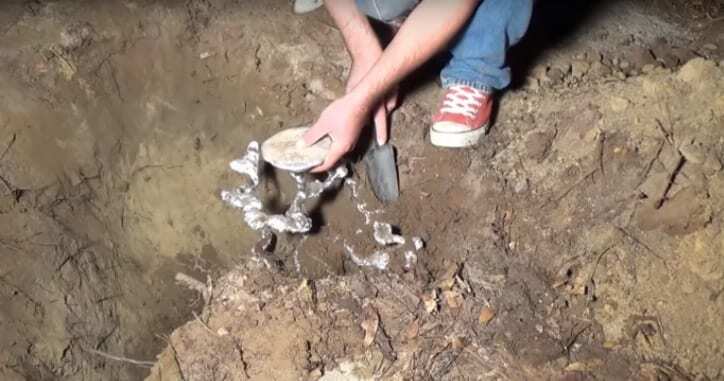 He begins by removing the top layer of soil, making sure not to injure or break off any of the pieces of the ant colony. He then takes a shovel and digs the entirety of the nest up and out of the soil, wearing gloves the whole time. The next, and perhaps most important step in this complicated yet fascinating operation is to remove the dirt from the structure of the ant colony. 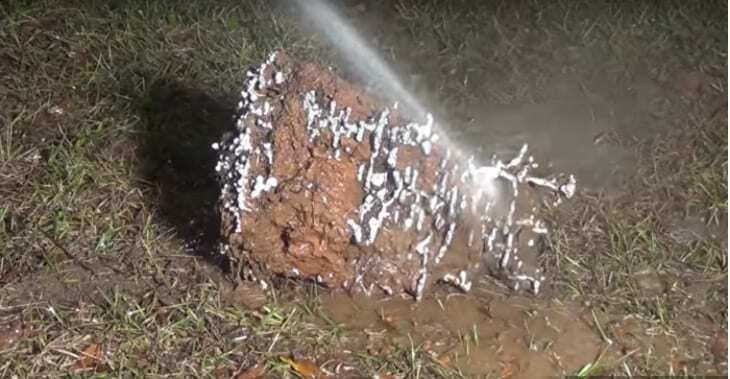 Using a power hose, the man power washes all of the dirt and grime off of the former empty ant colony. This process actually takes a while as he needs to get the dirt out of every nook and cranny. But the structure which is revealed is beautiful. A YouTuber who calls his page Anthill Art is the person who put up this fascinating video, amongst many others. He not only casts fire ant colonies in aluminum, but also bull ant colonies and the skulls of various other animals as well. 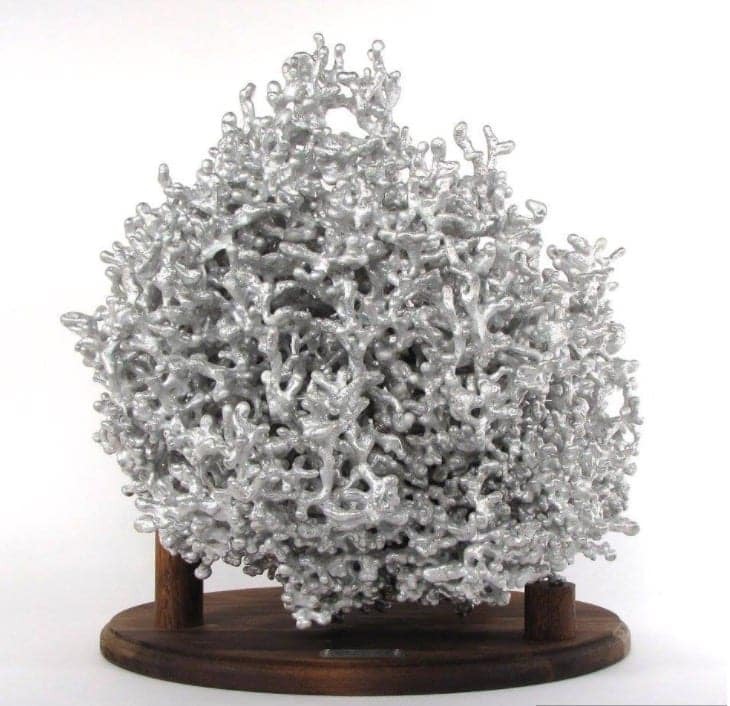 Once the aluminum hardens inside of the empty ant colonies, the cast of the largest colonies can weigh up to or even over 100 pounds. It is incredible what these tiny little creatures are able to do. These structures are extremely intricate and show a level of municipal and colony planning that many of our own human cities do not even have. These casts show intricate air shafts, rooms, and all manner of crisscrossing, interconnected walkways. It is incredible that the ants are able to navigate through it all, and in the pitch dark no less. 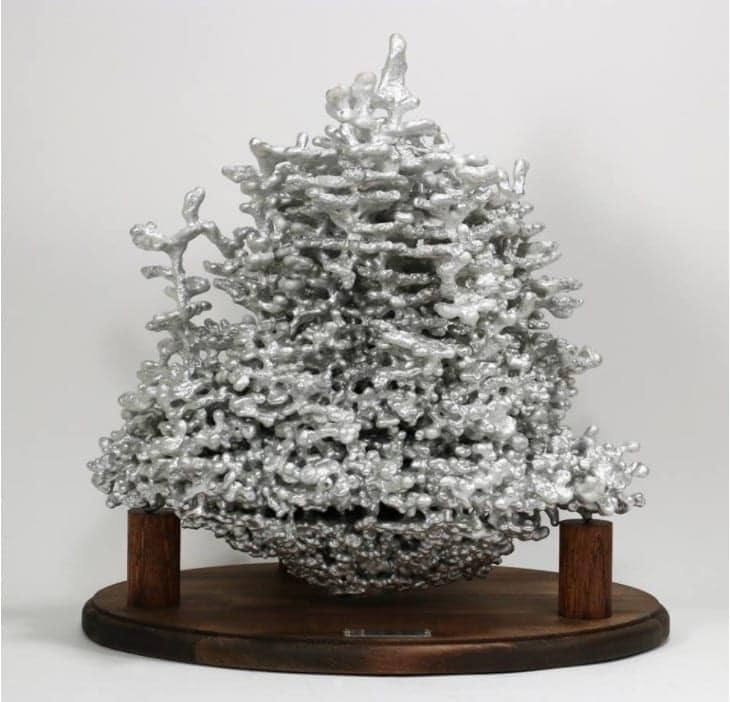 When the molten aluminum metal is poured into one of these empty nests, the aluminum is hot enough that it is able to fill up the ant hill and the colony completely, yet still malleable enough to be able to keep the original structure of the colony intact. The casts reveal that ants are indeed great architects, and research institutes around the world buy them in order to study how ant colonies are made. 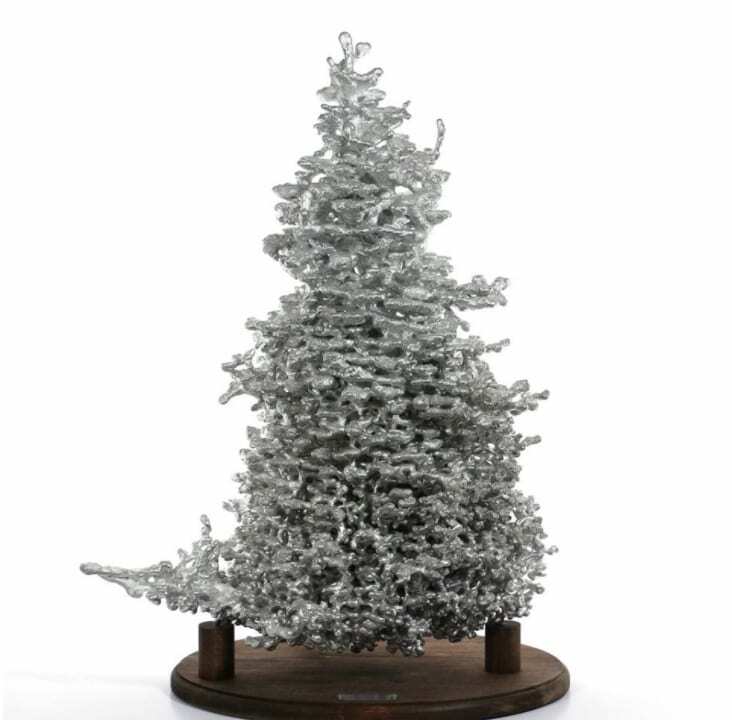 In addition to being informative, fascinating learning opportunities for scientists, the aluminum ant colonies are also quite impressive to the eye as well. 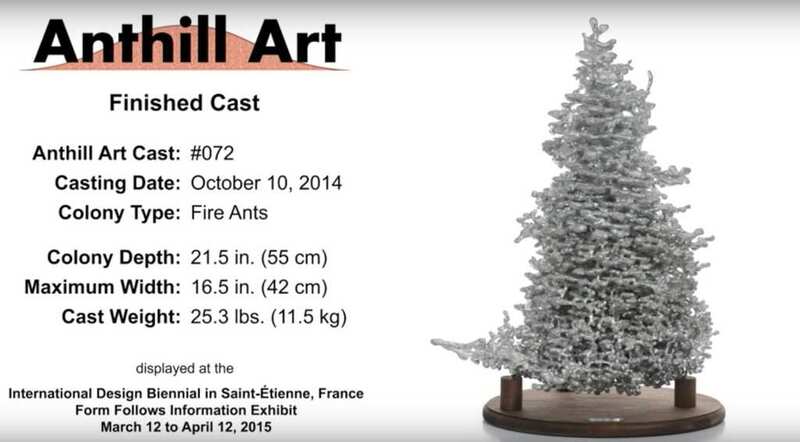 One of the anthills that Anthill Art cast was close to 100 pounds and was a foot and a half in height. While this may not seem impressive at first glance, imagine the size of the ants who built and lived inside. It is like humans constructing ten One World Trade Centers. This art piece has certainly caught peoples’ attention, as have the various videos the artist has made. In fact, this video has over 94 million views as of this writing. 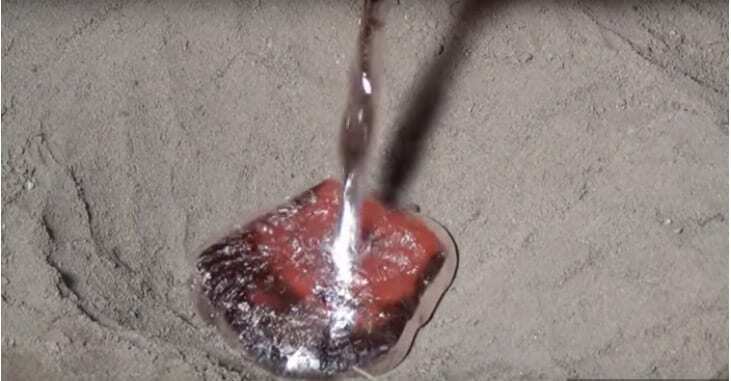 There is something about pouring a shiny, beautiful liquid into an anthill and then watching it get excavated that just makes you so relaxed. 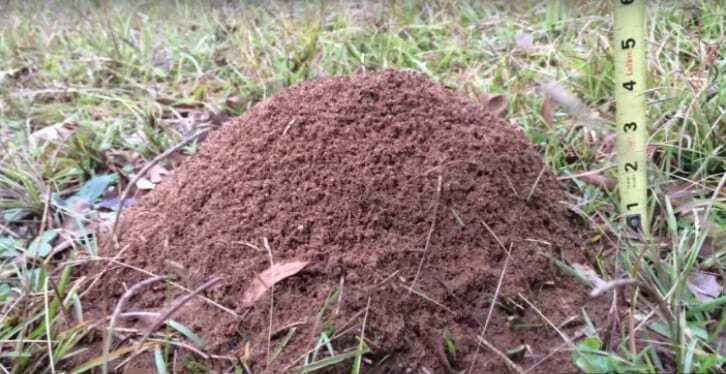 Perhaps it is because we have always wondered what the inside of an anthill looks like. And yet there are many people who did not like the video at all. Many said that the videos were glorifying ant massacre, as the man was pouring the molten metal while the ants were present in their homes. There are also those who say that the act of pouring molten aluminum into an ant colony and digging out what is inside is not art. That may be due to the fact that they are angry they didn’t think of it first. The comments on the YouTube video show that there are many people who love ants and wish them no harm. 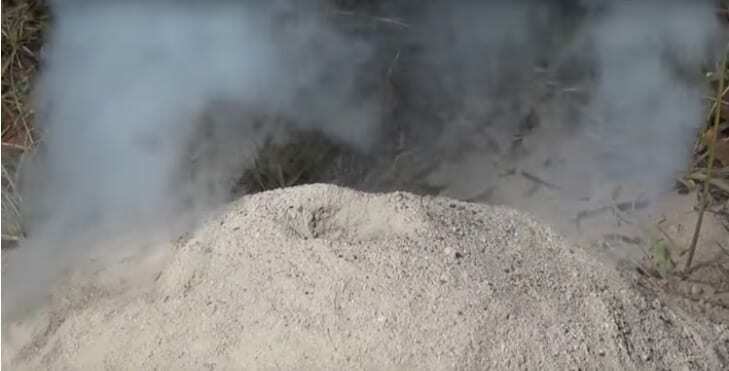 One commenter said that they were so angry at the man for pouring the molten aluminum down the anthill that they actually got sick to their stomach. The accuse the man of conflating murder with art. We wonder if this commenter would be ok with hiring an exterminator for their house. This same person continues on their pro-ant rant, arguing that the artist should be ashamed of himself for murdering so many innocent ants. The commentator then goes on to allege that the only reason that the artist makes these casts is because he has no morals and can only feel big and strong by killing animals. We think the artist is plenty big and strong, especially since he has to lug the casts away from the site. Amazingly, there were a lot of others who agreed with this person’s pro ant rant. They said that killing so many ants in the name of art is simply wrong as well as extremely inhumane. After reading this comment, we got to wondering if this same person would be fine with an ant infestation, and if he would be humane and let them live, or hire an exterminator to get rid of them. The artist who was behind these incredible ant molds finally came out of the woodwork in order to give his side of the testimony. 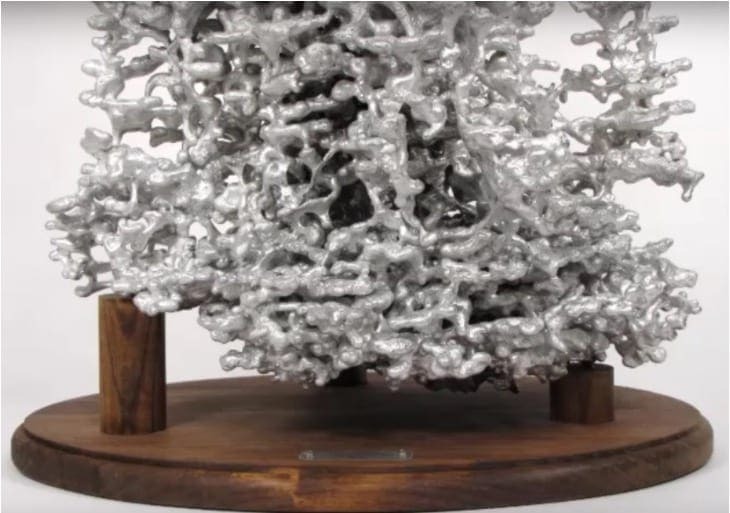 He says that the majority of the art casts he makes are of invasive fire ant colonies. Counties and municipalities all across the United States are battling to stop their spread. 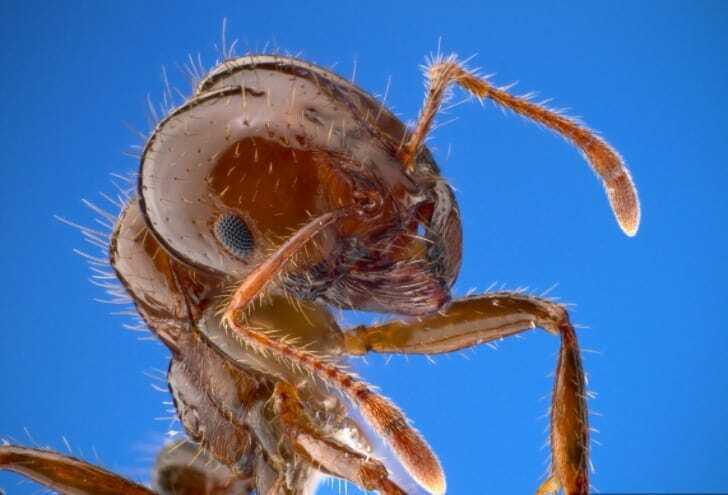 The ants pack a powerful, painful bite and can be dangerous to children. In a statement, the man further explained how he tries to be responsible in searching out and making his casts. He goes around and specifically looks for old, abandoned colonies and hills so that he lessens the environmental impact. 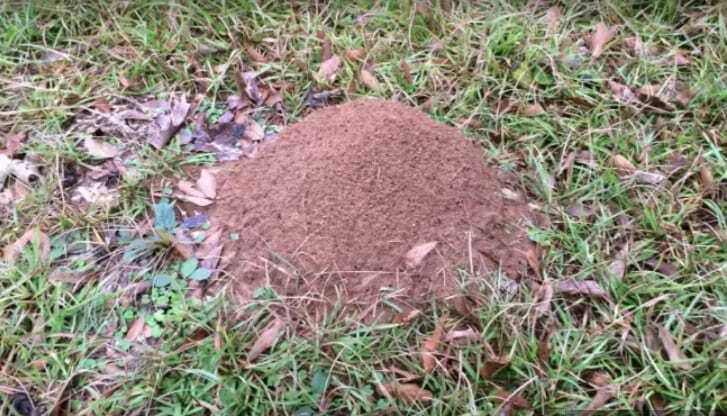 He says that nearly all of the anthills and ant colonies he finds are on his own property, and that his property is practically infested with the little creatures. In the meantime, a spokesman for a group which is dedicated to protecting the lives of insects called Buglife was quoted as saying that the group believes that the art form is ok, so long as the nest is empty when the molten aluminum is poured. He said that it presents a great way to learn about how amazing ants are when it comes to building. However, he says that should there be ants in the mounds, it is an extremely cruel way to kill them. While the artist’s work may seem to be controversial, the head artist and proprietor of Anthill Art does not appear to be slowing down. The artist’s company social media page has tens of thousands of followers, with people from all over the world clamouring to see what his next creation will be, and what the world right underneath our feet really looks like.